After months of waiting and wondering, our (first) day of reckoning is almost here: Saturday is Returning Registration, which will tell some of us that we are definitely going to San Diego Comic-Con 2017. And others will half-expire with anxiety as the badge sale minutes tick away and they don't get anything - but they'll still have a shot in Open Registration. Chances are, you've been through an SDCC badge sale before, and you know how brutal they are. There's no reason to think this weekend will be any different, and there's a possibility - given some of the backstage changes - it'll be worse. Here's how you can prepare yourself on a practical and psychological level. Talk to your buying group. Make sure everyone's legit and aware of the process. Make sure you trust each other when it comes to Paypal. Last year, the buyer got all the badges so if someone shafted you, you could just keep their badge. This year, every attendee gets their own badge - so having a certain level of trust for the stranger whose badge you're buying is a good thing. Don't double-cross or desert your attendee comrades. Some people will join multiple buying groups to increase their chances without any intention of helping others. Then there are people who join a group but shut down all their sessions the second someone gets them a badge. Stay in the game until the end to fight for your associates - and be loyal. Test your devices. Last year my friend's dog chewed through his Macbook cable, and it was only discovered the morning of the sale as the laptop was uncharged. Be sure all your devices work, are compliant with CCI's requirements, and won't be commandeered by your housemates or partner. Make sure you have room on your credit cards. 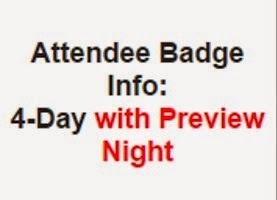 If somehow you're lucky enough to get picked twice while Preview Night badges are available, and you buy 6, you'll need to pony up $1590. CCI will come back to you later if your card fails and give you the option to put in another one. Use separate browsers for each session and adjust your power save settings. Don't flounce off in a huff if you "only" get Thursday/Sunday or just Sunday. You can try to upgrade during Open Reg, and even 1 day at the Con is worth it unless you're flying in from Antarctica or something. While it looks like the waiting room and buying process will be mostly familiar - the spinning blue circle, the inability to refresh - it's always possible that some nefarious new glitch will crash the system or sabotage you in some unfair, individual way. Don't lose your mind if this happens. Screenshot everything, note the time, and immediately contact CCI with your story and evidence. They are pretty good about helping people when they're given the right information. Finally, be good to yourself. Plan something indulgent Saturday night so you can shake off any bad mood from not getting a badge, if that happens. And don't overdo it Friday night; you don't want to be hungover during the sale. Your reflexes need to be sharp. No matter what happens, remember that you have another shot in Open Reg, and that there are many Comic Cons that are magnificent in their own ways while being easier to access. San Diego is not the only acceptable option. I'll live blog the sale, and answer any questions. If you're a lone wolf and want to join up with a pack, see me and I'll try to connect you with someone. Be as confident and prepared as you can and keep all outcomes in perspective. In the heat and tumult of a badge sale, it's easy to lose your religion over Comic-Con - but SDCC is only 5 days a year. Sometimes not getting a badge just means discovering something even better. This is my first early sdcc sale. How is it different and how fast will it go. It's pretty similar to open reg and goes just as fast. The main difference is that there are fewer people trying, so you are more likely to get into the buying screen. Yep! Assuming you participated in Open Reg last year, this will be the same. It does go fast these days, so just pay attention and be organized with the information of anyone you're buying for. EeeeeK! I'm nervous for the returning attendees! You're right about going fast. It seems as though each year it's faster and faster. I'm doing the waiting room with 2 people. Is that enough?